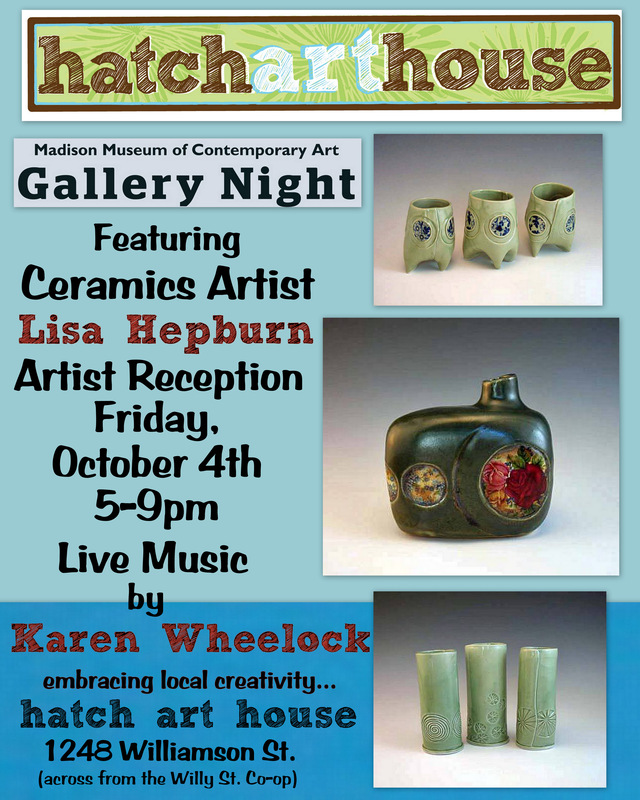 October Featured Artist; Lisa Hepburn Ceramics & Gallery Night! The October featured artist is Ceramics artist Lisa Hepburn. Lisa’s current work is informed by both a decades love pre-Colombian Mexican Pottery and a more recent obsession with all things mid-century modern. (A friend puts her design aesthetic this way: Mixtec meets Mad Men). Most of her work is built by hand with slab and coil methods. Most recently she has been experimenting with sculptural vase forms with unexpected negative space. While much of her current work is functional, she strives to create a sculptural sensibility in each piece. Above all, her work is meant to be touched. Lisa will have her work showcased at Hatch Art House from October 1st-31st with an artist reception Friday, October 4th from 5-9pm coinciding with the city-wide MMoCA Gallery Night. Refreshments will be served along with an outside performance by singer/songwriter Karen Wheelock. Check out the event page here on Facebook. And Karen Wheelock’s Facebook page here for a chance to listen to her music! Pick up Gallery Night maps at Hatch or on MMoCA’s website. The April featured artist is Madison ceramic artist; Jackie Matelski. In her ceramic practice, Jackie is focused on design; both for aesthetic pleasure and functionality. Each piece is created to be beautiful, unique, and practical. Her pots are intended to brighten up each meal, each cup of coffee, and each day. 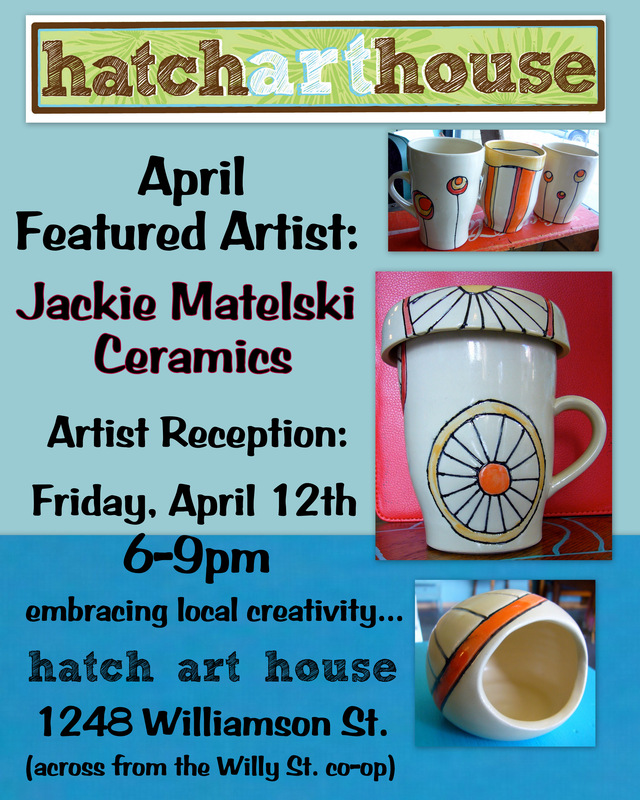 Jackie will be showcasing her work at Hatch from April 1-30th with an artist reception on Friday, April 12th, 6-9pm. Good times and refreshments will be served!